As Week Four wrapped up, we are fast approaching the midway point of the season, hard to believe we are halfway done. For those owners not having the best of seasons or those who are jumping in to take the reins of a faltering team. Look at Columbus, Minnesota, and Ottawa; three teams who were in the basement last year, and this year are very competitive. When your current position may be difficult, always look and build towards next year. Some great performances this week so let’s take a look at the Week Four Players of the Week. Matty_A_31 had himself quite a week, putting up 15 points in 5 games. Going undefeated and racking up a +22. The New Jersey train keeps on rolling sitting atop the league at 27-3-2, while tied with LA in points they have 3 games at hand. 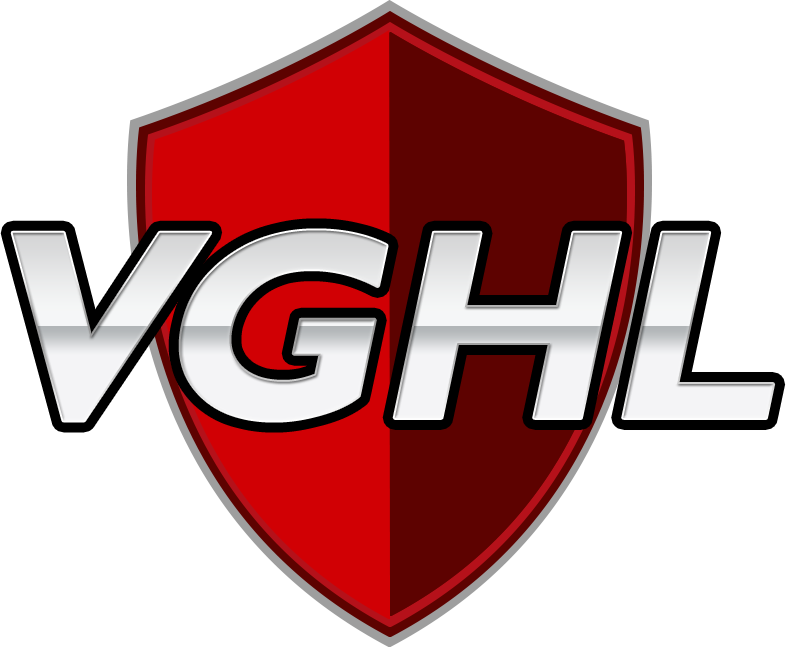 Matty_A_31 has been a huge part of this along with his defensive partner AAAAAAAAAGAABBA both are in the Top 10 in scoring for defense-men with the latter leading the league in points for defense-men. Speaking of huge parts, rharmer3 last week’s POTW coming close again with an honorable mention. Currently sits second among defense-men in points. 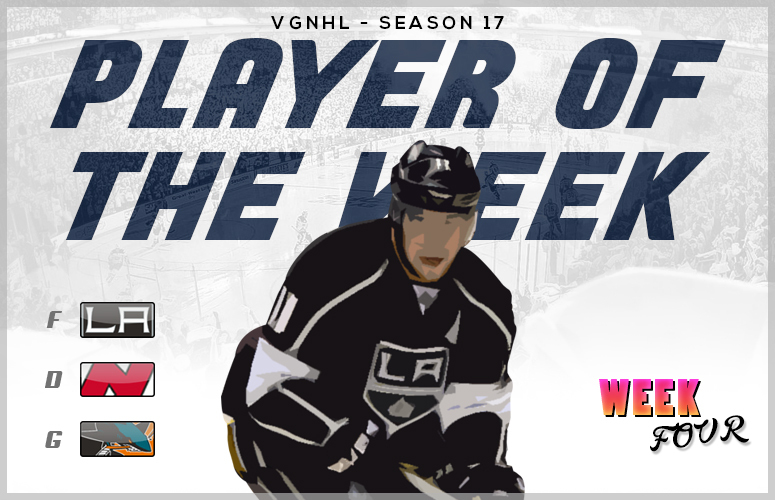 Can’t have a VG NHL season without TMills61_ snagging player of the week. As usual, this guy is solid across the board. In ten games he had 14 goals, 22 assists, 3.60 ppg, not to mention; a plus 18, only took 2 PIMs, had 3 power play goals, one shorty, 4 game winning goals, shot 35% and whew out of breathe here, and a 68.8% in the face-offs. Like I said, solid across the board. LA needs an effort like this out of TMills every week to stay atop the super competitive Pacific Division. This one was interesting. Also a quick lesson on why inputting stats is really important. I had to double check, make that triple check my numbers to ensure I selected the right guy this week. One big stat from above, is not reflected accurately on the site. Flight-airline was listed with a .72 GAA, which at first I thought was great, until I noticed his 13 GA. Then I noticed he has 1080 minutes played. Nine games played times 60 minutes, would be at min 540 minutes. He is double the minutes played, which is highly unlikely, so I adjusted it based on what i would consider to be the min he could have played. He still came out on top and had a hell of a week. Just like last year with, ironically one of the honorable mentions, Jade_Dragoon_ I only give you one pass if stats are input incorrectly. The other story is the tandem in Vegas of Wonderrocket and carbor. Combined these two went 9-1-3, faced almost 200 shots, with a combined .875 save percentage. You're one of the ****ters people like to beat up on, clown.